Nitrogen pollution has been an ongoing problem in our surface waters over the past few years. High nitrogen levels can lead to algae blooms, brown tides, fish kills, and declines in shellfish populations. That’s why Peconic Baykeeper is working with municipalities in Suffolk County to adopt a “Net Nitrogen Decrease” policy. This project is aimed at quantifying new nitrogen loads in specific municipalities, and offsetting those loads with advanced wastewater treatment adoptions, habitat enhancements, innovative agricultural techniques, or purchasing of development rights. What Peconic Baykeeper asks East End towns to do is simple arithmetic: Take out more nitrogen pollution than you allow to be put into our waters. If X new nitrogen load is permitted in the municipality, at least X+1 must be reduced in the municipality within the same year. *Projections based on 2013-16 single-family onsite wastewater permits issued by Suffolk County Department of Health Services. 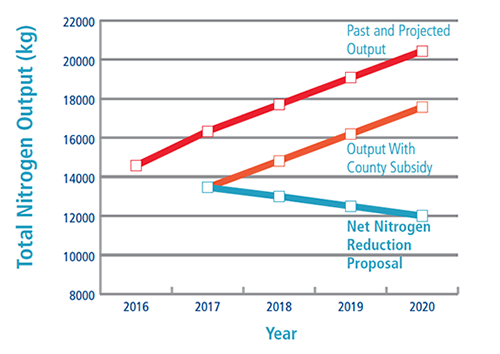 In order to achieve net nitrogen reduction, rebate programs should be paired with mandates requiring the installation of alternative septic systems in all new development.